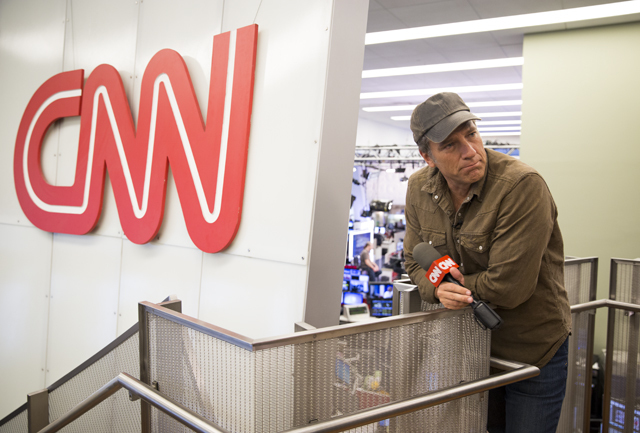 According to Nielsen Fast National Data, Mike Rowe’s Somebody’s Gotta Do It (SGDI) was CNN Original Series’ best premiere ever among 25-54, averaging 507k. The program averaged 943k in total viewers. SGDI had a +255% advantage over MSNBC’s The Rachel Maddow Show in the key demo (507k vs. 143k) and a +25% lead in total viewers (943k vs. MSNBC’s 757k). Fox News averaged 544k/2.770m last night at 9pm. CNN’s second highest Original Series premiere in the demo 25-54 rating was The Hunt with John Walsh (330k). The Hunt averaged 989k in total viewers. CNN also posted the most growth in weekday prime at 9pm last night vs. the prior four Wednesdays, increasing +152% among 25-54 (507k vs. 201k) and +77% among total viewers (943k vs. 534k). CNN’s other shows in primetime also topped MSNBC last night with AC 360 posting 282k vs. All In with Chris Hayes’ 104k, and CNN Tonight averaging 277k vs. The Last Word’s 148k.